The Eppendorf 5427R Refrigerated Centrifuge provides high throughput, aerosol tight centrifugation with tight temperature control for sensitive samples. This Eppendorf centrifuge holds up to 48 x 1.5/2.0 mL tubes in a high-speed rotor with a click lock lid for easy use and time savings, completely closing with just a 1/4 turn. The 5427R has a maximum speed capability of 16200 rpm, and a force of 25000 x g. After adding in your rotor, this microprocessor-controlled centrifuge will automatically recognize the rotor, set the appropriate speed, and detect imbalances for the best in safety and component protection. The interior chamber features a fast temp cooling function to prep the centrifuge before use, dropping from 23 to 4°C in just 11 minutes with an overall temperature range of -11° to 40°C. As a power saving measure this eppendorf refrigerated centrifuge also employs an Eco- shut off function, that powers down the instrument after a period of non-use, selectable by the user to help protect components, extend the life of the instrument and save operation costs. 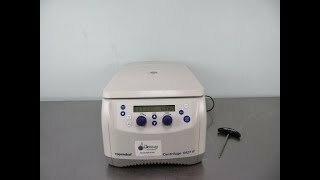 This Eppendorf 5427R Refrigerated Centrifuge has been fully inspected and is operating without issue. All of our lab equipment comes backed with our standard warranty. Should you have any questions, please don't hesitate to contact us.